The introduction of ox-drawn ambulances is a sign that President Robert Mugabe is taking Zimbabwe back to the stone ages, the opposition says. The nine ambulances are destined for rural areas around the capital, Harare, as well as more remote regions, where there is a lack of motorised transport. "Our neighbours are getting state-of-the-art services, while we are going backwards," an opposition official said. Zimbabwe's health minister said the new ambulances would save many lives. Zimbabwe is in the midst of an economic crisis, with annual inflation running at more than 400%, unemployment of some 70% and shortages of foreign currency. One health official told a South African newspaper that in many state-run hospitals, Panadol is the only available drug. "An ambulance will thus be a big luxury," he told the Johannesburg Star. 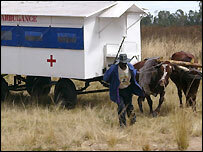 Pregnant women and children will be given priority on the ox-drawn carts, said Health Minister David Parirenyatwa. He urged the village leaders responsible for the ambulances to look after them and guard them against abuse. "We are going back to the stone ages," Movement for Democratic Change spokesman Paul Themba Nyathi told BBC News Online. Rural communities have long used donkey-drawn carts to take the sick to health clinics "but when this is the official, state-provided service, you have to be worried," he said. However, one international health official told BBC News Online that it was unfair to blame the government entirely for the crisis in the health system. "Aids and structural adjustment policies, which led to the introduction of users fees also played a part," she said. She added that the ox-drawn ambulances were the "appropriate technology" for remote rural areas, where people may not be able to access fuel or spare parts for motor vehicles. The ox-drawn ambulances were donated by the United Nations Children's Fund, Unicef, following a request from the Zimbabwe government. Maternal mortality has increased from 283 per 100,000 live births in 1994 to 695 per 100,000 births in 1999. "The gains made over the last 20 years to address maternal mortality, especially to provide emergency obstetric care services, are at risk of being lost," said Dr Juan Ortiz, Chief of the Health, Nutrition and Environment Section at Unicef. "We know that most of the complications related to childbirth are preventable if obstetric services are available, especially in remote areas," he said. Unicef officials say that the ambulances could indeed save many lives as Zimbabwe's rural women live an average of 10km from the nearest health facility.